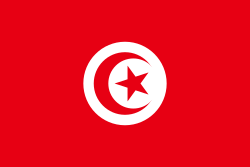 The flag of Tunisia is a national flag. It is red and white in colour with a star inside a moon. It was created for the first time in 1831 by the Tunisian bey Hassine I. Since then, it has had some small changes. This page was last changed on 6 May 2018, at 04:50.